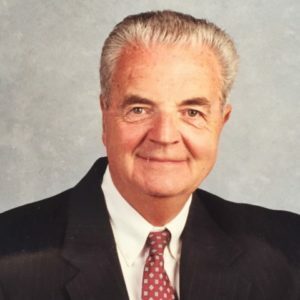 Shrewsbury – Paul R. “Darce” Darcy Sr., 80, of Shrewsbury, died Sept. 6, 2018 in his home, surrounded by the family he loved. Paul was born Aug. 30, 1938 in Newton, son of the late Cornelius and Evelyn C. (Mooney) Darcy. He graduated with the class of 1956 from Saint Mary’s High School in Waltham, and later from Boston College in 1974 with a Business degree. Paul honorably served his country with the United States Coast Guard. On Feb. 1, 1964, he married Mary Louise Norton in Our Lady Help Christians Church in Newton. They settled in Shrewsbury in 1975 and had been residents ever since. Paul retired as the Senior Loan Officer for Salem Five Cent Bank in the Auburn branch. Previously, he had held several banking positions at Freedom Federal Bank, Northeast Federal Savings and Loan, and Watertown Federal Savings and Loan. He was a 3rd degree member of the Knights of Columbus Adelphi Council # 4181, and a member of the Northborough Lions Club, the Picard Post # 234 of the American Legion in Northborough, the First Friday Club. He was also a faithful member of Saint Mary’s Parish, where he was a Eucharist Minister for several years. In his retirement, Paul lived his faith as a hospice volunteer at the Notre Dame Hospice, providing comfort and companionship to those in their final months. He was a member of “Brothers Boys,” an investment club of his high school friends. Paul leaves his wife of 54 years, Mary Louise Darcy; his children, Paul R. Darcy Jr. and his wife Rosa of Hamden, Conn. and Kathy D. Serra and her husband Paul of Nashua, N.H.; and seven grandchildren, Nicholas, Drew and Max Serra and Kayleigh, Kaitlyn, James and Kelsey Darcy. He was predeceased by a brother, Neil Darcy, and a sister, Alice Higgins. Relatives and friends are invited to visit with Paul’s family Monday, Sept. 10, from 4-7 p.m., in the Britton-Shrewsbury Funeral Home, 648 Main St., Shrewsbury. His funeral Mass will be celebrated Tuesday, Sept. 11, at 10 a.m., at Saint Mary’s Church, 640 Main St., Shrewsbury. Burial will take place in the family lot at 2 p.m. at St. Patrick’s Cemetery in Watertown. Please honor Paul’s memory with a contribution to ALS at www.alsa.org or to Saint John’s Food for the Poor, 20 Temple St., Worcester, MA 01604.